The Golden Spike is driven in Harrisburg, NC! The live steam operation located in Harrisburg, NC has completed work on the first loop. 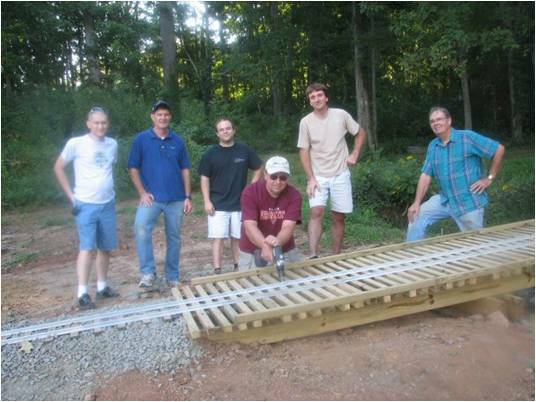 The club is part of the Triad Live Steamers live steam train club currently based in Farmington, NC. The club is growing in members rapidly and their calendar is filling up. Below are photos of the last spike and the first train to travel the loop. Visit www.triadlivesteamers.org for more information! 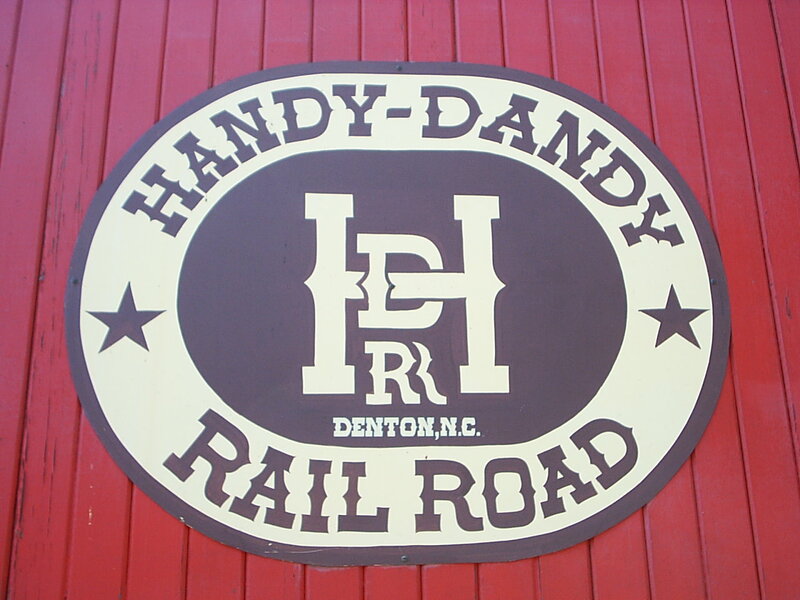 The route from the highway to the Handy Dandy Railroad, located in Denton Farm Park, is country, rural and scenic. As you’re driving down highway 109 in southern Davidson County, NC, you may notice a slight puff of gray smoke rising gently above the tops of the trees. You know you’re getting closer. As you come around a bend in the road you hear the faint sound of a train whistle. Getting closer all the time. Then, as you pull up to the park you notice the tracks that go straight across the front yard and the driveway in front of you. Careful not to cross without checking because off to your right, through the woods and around the corner comes old engine #9, pulling it’s tender and 3 coaches full of moms, dads, grandparents, neighbors and yes…tons of kids who all have smiles on them as far as their mouth’s can reach. What most folks don’t realize is that it takes days, weeks and months of hard labor and maintenance to not only get one of these engines going, but to also keep them going at all times. Many of our beloved NC steam engines are in the process of being repaired. The NC Transportation Museum in Spencer’s shay locomotive is currently “in the shop.” In addition, the giant steam engine “1702” owned and operated by the Great Smokey Mountains Railroad is also out for repair. That leaves us with the one and only Tweetsie Railroad, right? …..Wrong. Built in 1942 for Bethlehem Steel, engine #9 ran for several years in a Norfolk, Va shipyard. The locomotive ran in Greenville, SC and was then taken up to Burnsville, NC for a tourist line, which never came to fruition. The engine was then trucked to Denton, NC from Burnsville, NC. The 1.6-mile loop of track was added at the park after the engine was brought in and coaches were built out of flat cars. The engine only operates a few times per year. However, companies and other civic organizations may rent the park and train. The depot and water tank were added to the park. The log cabin, which the depot was expanded upon, dates back to the mid-1800’s and the whistle on the engine was at one time, part of the Great Smokey Mountain Railroad’s engine. At one point, locomotive #9 even went to California and beat a Shay in a race and thanks to the hard work and efforts of a handful of people, the engine is in better and better shape year after year. The engine started out as a saddle tank, but the folks in Denton wanted a tender. So, they used a big, round water tank and ran over it with a steamroller in order to construct the tender car. Tons of work was done and after awhile they had to put in a liner, which made the quality of the water go up, hence the engine ran much better. In fact, the tender was even used as a swimming pool for a while on July 4th. Brown Loflin, who owns the park, wants the train to be profitable but will only run for festivals because of the politics that start flying around when steam engines get fired up and people start coming out of the woodwork. More and more people come every year just to ride the train and the demand is there. 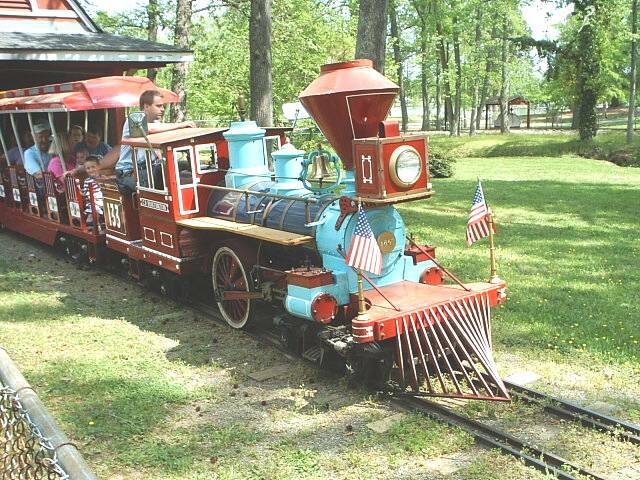 Recently a letter was written to Denton Farm Park asking for train to run during The Annual Bluegrass Festival. One problem is that people come to the park all the time asking to fire the engine. However, consistency is all too important and only the same people are allowed to operate the locomotive. There is no margin for error and if the boiler explodes it could end all steam rides in NC forever. According to Barden, operating a steam locomotive takes years to master and you must practice hard to develop your skills as an engineer. A year or so ago, some cowboy actors called Brown the owner and wanted to do a holdup on the train. The cowboy act was a success and no live ammunition was used. Their plot was foiled though, as staff members drove golf carts up to the holdup scene to check out the action. There are many, many more stories Engineer John can share with you. Just walk right up to him when he climbs out of the cab of old engine #9 and he’ll oblige with a story and a smile. Steam train lovers of North Carolina unite! Unite around Denton Farm Park and the owners of the Handy Dandy Railroad. Continue to show your support for all the workers and the intense labor they pour into engine #9 on a regular basis. 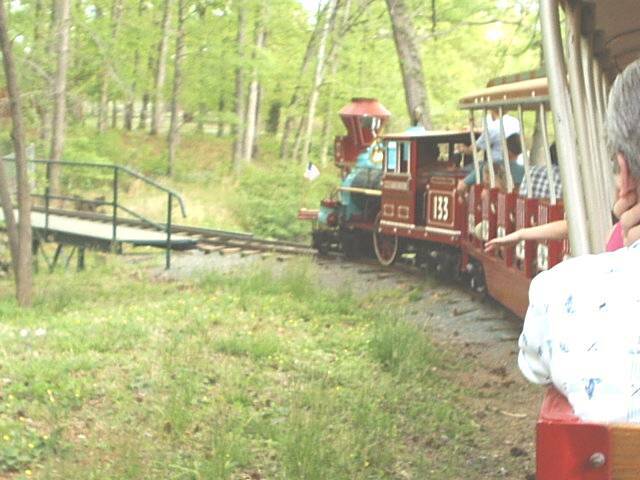 There is hope that the train and park could one day become a statewide tourist attraction much like Tweetsie. 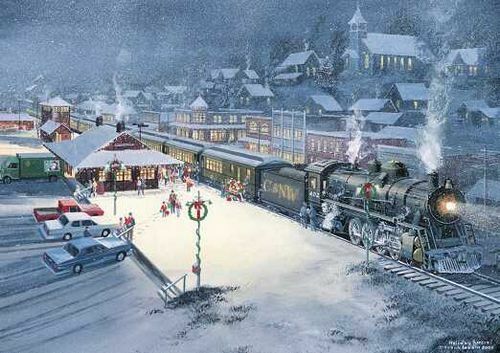 There’s something special about Christmas, snow and steam locomotives & trains. Every year when I was a child I absolutely had to set up my trains to go around the Christmas tree. Many times they would go around the tree, through the living room, under the sofa, back around the dining room and end up back at the tree. Now, my son is the same way. So, when I see pictures of trains in the snow I think of Christmas. A company called Holiday Card Center apparently does too. 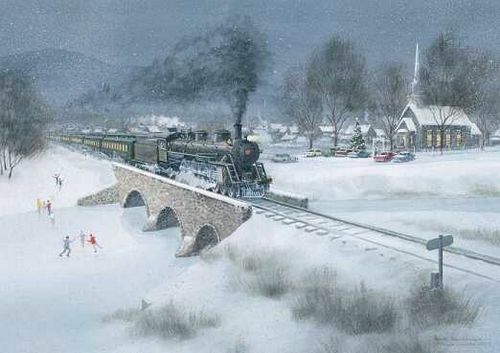 They seem to have the most incredible paintings of trains in the snow at Christmas-time. Visit The Holiday Card Center website to view all of their awesome Christmas Train Cards and place your order! Cass Scenic Railroad State Park will be hosting Harvest Day on Saturday, September 27. “This is a great family event full of old fashioned fun, live entertainment, and fall colors, capped with a special evening dinner train to Whittaker Station, “according to Dave Caplinger, Park Superintendent. This event is in addition to Cass’s regular excursions and interpretive programs during the day. The day includes Mountain dance master Lou Maiuri demonstrating and teaching square dancing and traditional Appalachian dance. Antique farm engines and tractors will be on display, many of them operating. 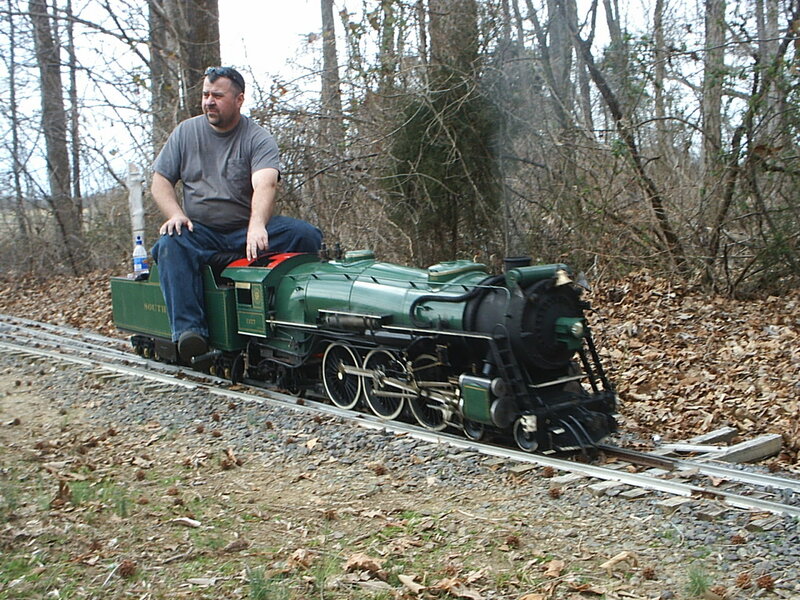 Joe Holbrook and his “Live Steamers” will be offering free train rides on his miniature live steam train. Miniature trains are a duplication of existing engines, operational, and can accommodate passengers. ALLEGANY – David Berlinski used to live a half of a block from one of the main train yards in Buffalo. 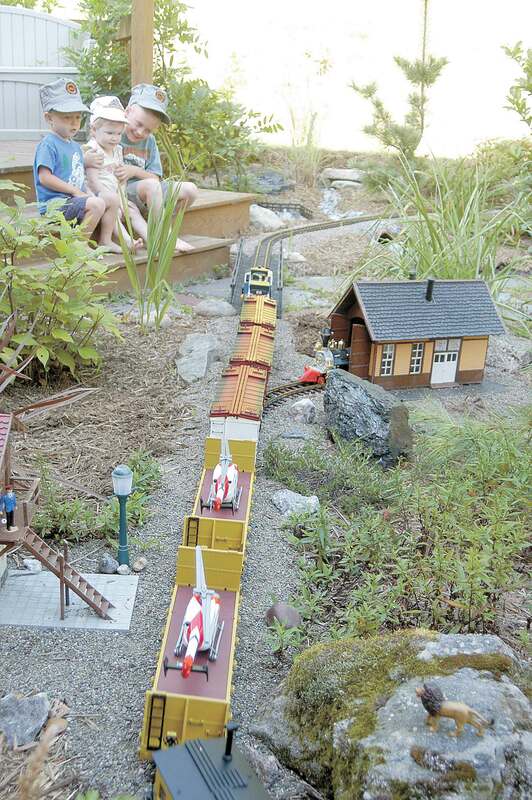 But trains never fascinated him until his 6-year-old son Mychal fell in love with trains a few years ago. Now, donning a T-shirt of a coal-burning steam engine from Strasburg Railroad in Pennsylvania, he gleefully will tell stories of his family watching the extensive miniature train that snakes through a bed of shrubs and flowers in his back yard. My grandparents lived in Burlington, NC. Some of my fondest memories of both my grandfathers involve trains. Papa Wink used to take me to the City Park there in Burlington where we would ride the little 24 gauge train that went around a big loop in the park, over a creek, through a little tunnel and into a fine looking station. The park also houses a vintage Merry-Go-Round that was assembled in the 50’s, but has even deeper history. Going back to the park to take my son on that train ride was such an incredible experience. It brought back some very vivid memories of my grandfather and the times we spent riding that train. My son absolutely loved it and still does. We still visit often and even had his birthday there one year. 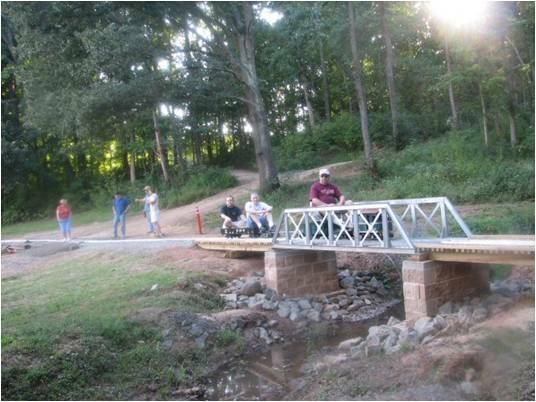 Click HERE for more info on the Burlington City Park. RailPictures.net has a gigantic collection of some of the most amazing train pictures I have ever seen. I’m keeping my wallpaper fresh with a new image every day. Amazing search function on this site as well.